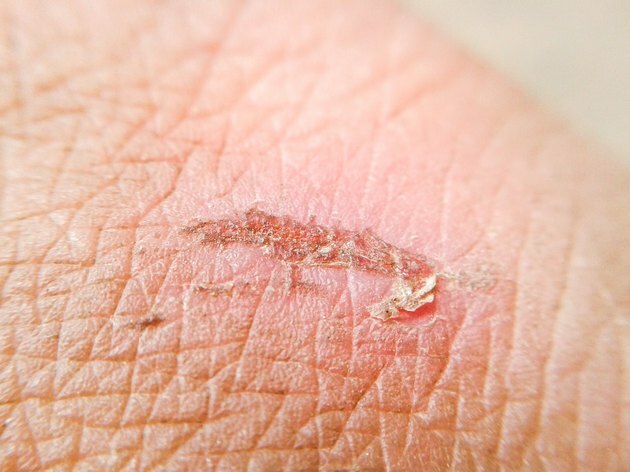 Any type of injury you sustain to the skin can result in scarring. Cuts, burns, incisions and acne lesions are all known to stimulate the production of scar tissue, especially when the wound penetrates into the deeper layers of your skin. During the process of healing, your body produces collagen and other connective tissue to essentially seal the injury site. Sometimes, the scar tissue that forms is much darker than the surrounding skin. And while there's usually no medical reason to fix scarring, some people find these dark scars unsightly and want to improve the cosmetic appearance of their skin. Massage a silicone-based cream or gel into the injury site each day to help flatten and lighten scar tissue, suggests the American Academy of Dermatology. It can take roughly six months to see an improvement in the appearance of your skin. Apply topical retinoids twice a day to the scar tissue. Normally used to treat acne, this prescription medication can help flatten raised scars and break up any melanin that is causing discoloration, which can lighten the irregular tissue to match the surrounding skin better. Cover the scar tissue with a topical corticosteroid to decrease inflammation and minimize any redness. Topical corticosteroids are often used in combination with retinoids and even silicone-based creams to improve the efficacy of the medications. Talk to your doctor about intralesional corticosteroid injections, suggests the American Academy of Facial Plastic and Reconstructive Surgery. Injecting steroidal medications directly into the raised, red scars can help flatten and lighten the irregular tissue with the rest of your skin. Freeze the raised, red scar tissue with liquid nitrogen, dry ice or another freezing agent, advises the American Osteopathic College of Dermatology. This causes the irregular tissue to die and fall off. Undergo laser therapy to diminish discoloration and flatten the scar tissue with the rest of your skin. The laser energy breaks down the scar tissue, while destroying the melanin that's causing the hyperpigmentation. Remove the scar tissue with a surgical scar revision procedure. A cosmetic surgeon extracts the scar tissue from the skin, suturing the surgical wound in such a way to make the new scar less noticeable than before. Corticosteroid injections are often used after cryotherapy, laser therapy and surgical scar revision to curtail the formation of dark, raised scar tissue again.